The day started off with a 9 a.m. meeting at Berg’s (Eugene&apos;s local snow sport shop). 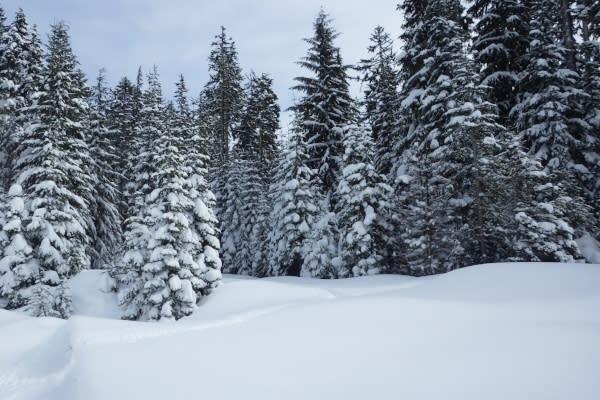 We were to meet the guides there to rent our snow shoes and load up the car. Fortunately, I had met the guides before, so I knew who to look for. The owners of Misguided Outfitters, Adam and Elliott, had made it a point to meet with me prior to go over all the details of the trip. 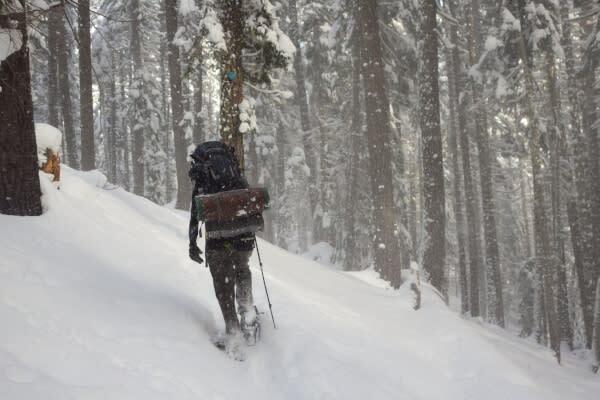 This trip was a customized backpacking trip to Oregon’s Pengra area. 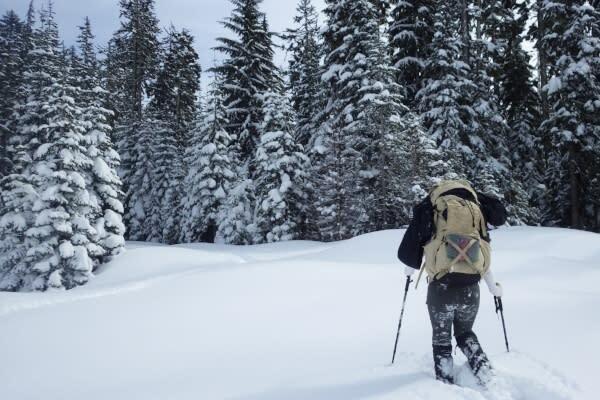 More specifically we were to put in near Willamette Ski Pass Area and snow shoe all the way to Maiden Peak Shelter, camping along the way…in February…in the snow. Now this normally might not sound very fun, but we checked the weather beforehand and the forecast showed sunny skies all weekend. Plus, Misguided Outfitters provided whatever gear we didn’t have ourselves, namely a four-season tent. It also didn’t hurt that we were avid backpackers and heading into the Cascades in winter, outside of a ski park, was something we’d yet to see or do. So we threw our gear into the car and headed off for an adventure. It was gorgeous once we got to the trailhead. The skies were clear, and the sun was able to peak through the trees to really light up the snow. 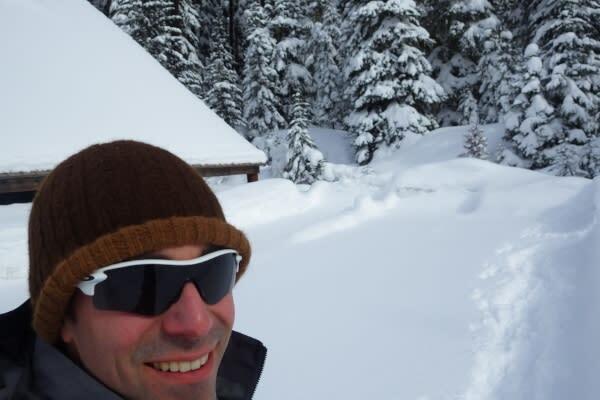 It was evident that this was my first-time snow shoeing as I could feel myself working muscles that I wasn’t used to. But we made good time and were able to take a few stops along the way for pictures. Once the sun began to set we decided it was time to stop for the day and set up camp. I was excited about this since I’d never camped in the snow. Elliott gave us a quick tutorial on how to prep the site for our tents, which consisted of stomping out a flat spot in the snow and building a snow wall to protect the tent from wind. Once finished, we all gathered in the main tent for dinner, drinks and storytelling. It had been a great day and I was looking forward to more of the same tomorrow. Unfortunately, Mother Nature had other plans for us. Despite the weather forecast showing clear skies all weekend, at about 2 a.m. a blizzard hit. The temperature dropped to about 18 degrees and my tent was bombarded with 50 mph winds. I awoke the next morning to snow covering my sleeping bag. The winds were so bad that my “snow wall” no longer existed and snow was blown through the rain fly and into my tent. Luckily my gear kept me dry and warm. Adam did a quick overview of the situation and concluded that it was probably best if we headed back. Unfortunately, you can’t predict what the weather will do and this time it just wasn’t in the cards for us. The previous day we had passed a gorgeous snow-covered lake, but on our way back you wouldn’t even have noticed a lake was there. It was a white-out. Again, it just reminds you of how quickly things can change. We made it back to car and began loading everything up. Adam and Elliott were a little disappointed that we couldn’t finish the trip, as they wanted to make sure that we had the best experience possible. We quickly assured them that we did! While it was cut short, the first day had been amazing and so much fun. 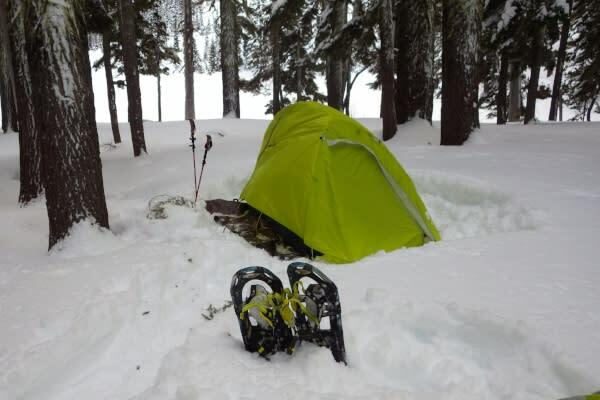 I can now also say that I’ve gone winter camping, snowshoeing and slept through a blizzard! The excitement and the adrenaline rush alone was well worth it. We made a quick stop at the Brewer’s Union Local 180 in Oakridge for a beer and a burger. There were no ifs ands or buts about this since the Brewer’s Union is quite possibly a right of passage for anyone coming back from any sort of outdoor activity in the Oakridge area. We relaxed and sipped our drinks while Elliott took over the piano in the room, but don’t tell too many people he can play. It’s more of a treat if it’s a surprise. Then we headed back to Berg’s. We unloaded the car and said our goodbyes. Even though we came back a day early, we had plenty of experiences to fill an entire weekend and had the pleasure of spending time with some truly amazing people. This trip created fond memories that I’ll never forget. Even if it’s not winter camping, I highly recommend the guys from Misguided Outfitters who took care of us every step of the way. There’s no one else I’d rather have teaching me about survival skills and the wilderness than those two. And they’re always up for another adventure! Joey is an avid sports fan and outdoor enthusiast. When he's not out exploring the Cascades or playing team sports, Joey can usually be found exploring Eugene, Cascades & Coast breweries. He is the Director of Sports Sales & Development for Travel Lane County.